I didn't know quite what to expect from McClelland and Stewart's 2007 release King of Russia: a Year in the Russian Super League. Let's just say I'm so impressed by this book that I'm almost overwhelmed. King of Russia is about Canadian hockey coaching legend Dave King's journey to the Ural Mountains to become the first Canadian coach in Russia. The book is based on King's daily diary, typically meticulous and refreshingly open, and polished up beautifully by The Globe & Mail's ace hockey reporter Eric Duhatschek. I personally consider Duhatschek to be the best hockey journalist out there for quite some time. Not only is he incredibly connected, thorough and respected, but he's got an easy to read and captivating writing style. So I guess I shouldn't have been so surprised how easily I was drawn into the text. But I was very pleasantly surprised just how compelling and fascinating the text is. One biography or well written autobiography that I've always wanted to read is that of Coach King. He is a three time Olympic coach, and formerly the one man Canadian national team king-pin. He's also coached two NHL teams and teams all over the world. As one of the greatest bench tacticians ever, his story potentially has so much to offer a reader - about the Soviets, about the NHL, about Canadian hockey and about European hockey, and so much more. King of Russia isn't that book. Instead is a look into a single season of King's career. I cracked the spine already disappointed because I knew it wasn't what I was looking for. A few paragraphs later, I realized I had found quite possibly the leading candidate for best read of the new hockey book season. Back when King was coaching in Calgary, the NHL had a great influx of eastern Europeans. One of them was Soviet great Sergei Makarov. We North Americans were never truly understanding of the hardships these guys faced. A whole new country, a whole new way of hockey, a whole new language, a whole new life. They understandably struggled, and we were quick to dismiss them as inferior, and never truly understood the incredible transition they had to go through. Well now we can, but in reverse. It is the Canadian, King, pioneering his way into Russia. He had to deal with the strange new homeland, a language barrier, a cultural 180 degree turn and a stubborn and peculiar hockey system. Oh, and there's such 21st century hazards such as the Russian mafia. Finally Coach King understands Makarov's struggles all too well. Through it all, King tries to finds the silver linings, but in his daily diary he is very open about wondering if he has made a big mistake. At times we get to see the rare vulnerable side of a hockey legend. But we also get to see so much more. By the end of the book, I'm converted in to a Metallurg Magnitogorsk fan and am looking online to buy a jersey. I feel for many of the players, much like King can't but help develop but must depress. King looks to former NHLer Dimitri Yuskevich defenseman to be an early pillar, and an English ally. Swedish defenseman Anders Eriksson and Canadian goalie Travis Scott are also relied on heavily. Ilja Vorobiev becomes a favorite of Coach King and of any Canadian reader. Others on the team include gormer NHLer Igor Korolev, the wildly enigmatic Stanislav Chistov and teenage phenom Evgeni Malkin, who leads the team and the league, but will soon leave the league to join the National Hockey League. Malkin's departure allows to better appreciate how the Russians feel about the NHL continually uprooting the country's top young players. It's a real eye opener for us Westerners, and maybe the Russians have a point when it comes to their continuing dispute about player compensation with the NHL-IIHF player transfer agreement. King learns first hand why the Russians are able to develop incredible individual talents but poor international teams. Its a far cry from their glory days, that's for sure. Through it all, King is continually open and perplexed, and as usual successful. Its an amazing look into just one year of an amazing life. I still want a great biography or autobiography of Dave King, but I now realize it would take volumes to cover his hockey insight. Just read this book today. I thought King pulled a lot of punches, like he was too scared to offend anyone. For example, we never learned who The Fish was. Despite that, I also enjoyed the read. 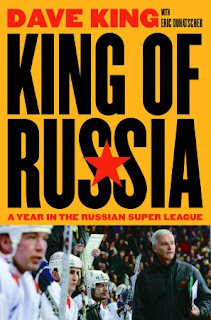 A nice look into how the Russian hockey world works, plus the snapshots in the lives of Malkin, Yuskevich and Korolev, among others. Definitely recommended for a hockey fan.